Whenever I make a heavy necklace, I tend to make it longer to help balance the weight. If you follow the instructions here exactly, you will end up with a very long necklace that adjusts from 27 to 30 inches. I like to twist the necklace up to wear it, which shortens it somewhat, but it is still a very long piece. If this will be too long for your frame, shorten it up accordingly. 1. Crimp a 30" piece of beading wire to the middle hole of your end bar. Alternate copper bicones with open hex beads. Slide a 4mm turquoise round into the middle of each hex bead as you string. Place the copper bail at the mid-point of your strand. When it is long enough to suit you, crimp the loose end to the other end bar. 2. 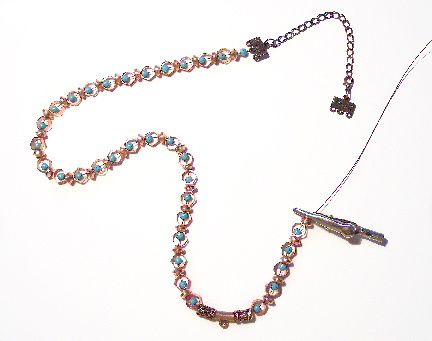 Use jump rings to attach copper chain on each side of the central strand, running from end bar to the opposite end bar. Divide each half of the necklace into four equal parts, and anchor the chain in place to the nearest hex bead with jump rings. 3. Prepare all of your leaves by creating wrapped loops on the head pins. 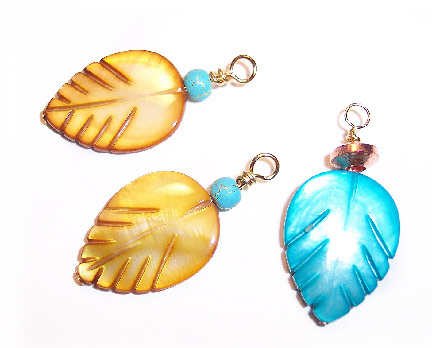 Add some decorative turquoise or copper beads to each dangle. 4. Divide up the leaves and space them out along each chain. Reserve a few leaves to hang in front, near the bail. Attach each leaf dangle with a jump ring. 5. Prepare your central turquoise donut pendant. Fold a 10" piece of beading wire in half loosely, and create a larks-head knot through the donut. String both wires through a copper bicone. Separate the wires, and string 7 to 10 seed beads on each. String one wire through the loop on the copper bail. Bring both ends of the wire through a crimp bead from opposite directions. Snug up the wire, flatten the crimp, and trim the wire ends. Attach 6 hammered copper discs together with jump rings, and embellish the donut pendant with them. 6. 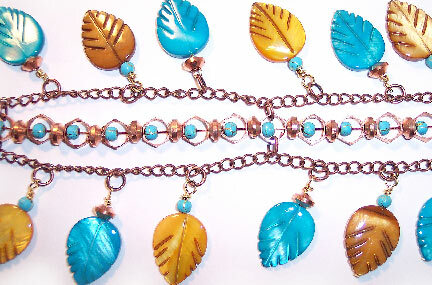 Attach 3 hammered copper discs together with jump rings, and embellish the end of the clasp and chain unit. To wear this necklace, hold by one end and spin it until the chains are wrapped around the central strand to your satisfaction. 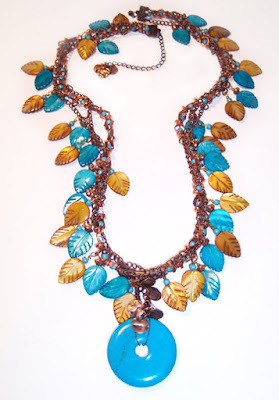 The tighter you twist it, the shorter the necklace will be and the more the leaves will stick out from the piece. 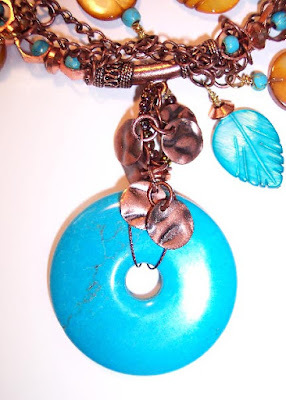 Cyndi, I love this autumn inspired turquoise and copper necklace! What a stupendous design!